In Japan, that is. All the more surprising considering that Christians constitute at best one percent of the population. Or perhaps that simply makes it exotic. Catholicism has the deepest roots, having arrived in Japan in the mid-16th century. So the aesthetics of Catholic culture and architecture are the first things Japanese think of when "Christianity" is mentioned. After that comes the ecclesiastical structure, extrapolated from the Roman Curia. 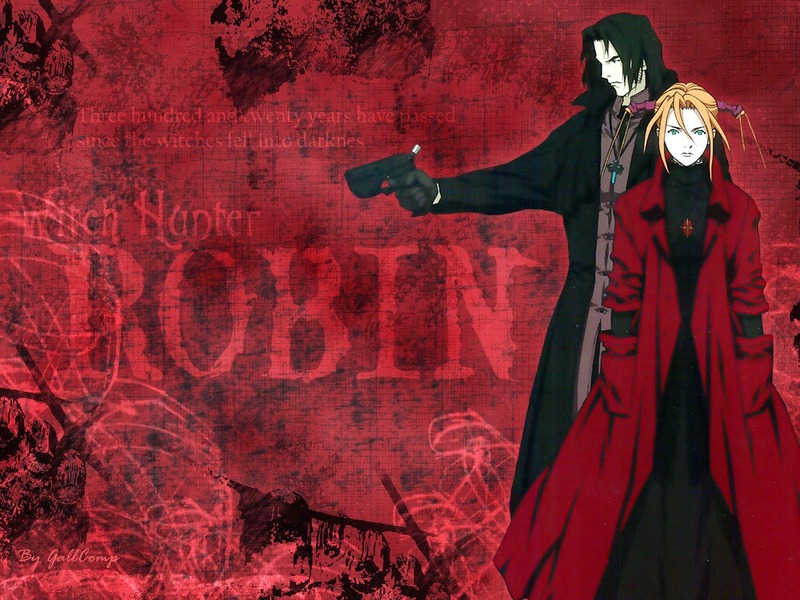 Anime like Witch Hunter Robin and Hellsing (Catholics vs. Anglicans) play off the supposed existence of an imperial Catholic church that shows up in movies like Constantine, Stigmata, and The Da Vinci Code. The Catholic church is just too cool an institution not to imagine running a global conspiracy. Although in A Certain Magical Index, that role falls to the "English Puritan Church" (if you were wondering what the Puritans have been up to for the past three centuries). And as with the U.S. spy agencies, the Catholic church is also a good source in the paranormal action world of skilled agents, operators, and intelligence networks. Ghost Hunt is an ensemble paranormal actioner, so it naturally features a Catholic priest as one of the ghost hunters. 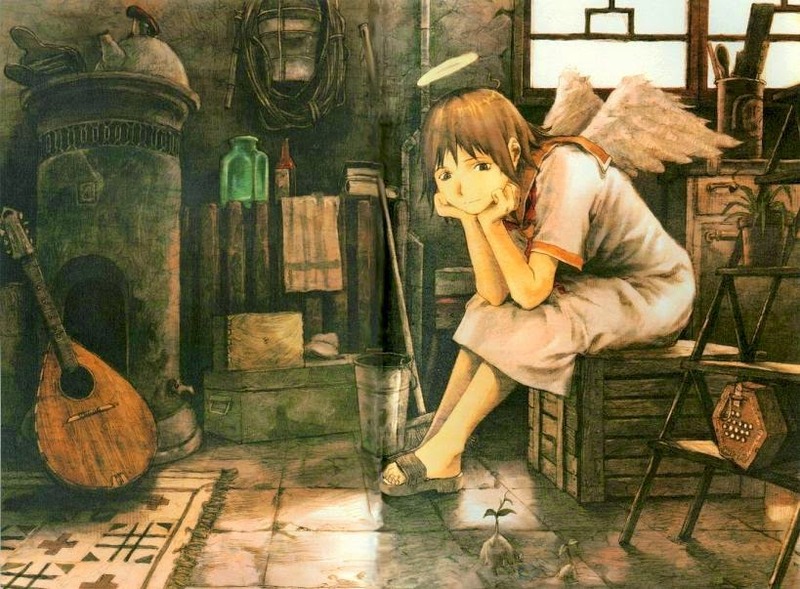 At the same time, in terms of theology, the suggestively Catholic Haibane Renmei can stand beside any of C.S. Lewis's work as a powerful Christian parable. The same is true of anime such as Madoka Magica and Scrapped Princess, though you may have to look harder to see through the metaphors. Along with Camille Paglia, Japanese writers have discovered that "medieval theology is far more complex and challenging than anything offered by the pretentious post-structuralist hucksters." They eagerly pilfer Christian eschatology for interesting characters and conflicts (another good reason to study religion!). Kaori Yuki's Miltonesque Angel Sanctuary turns Paradise Lost into a Gothic romance, with a war in heaven and a descent to the underworld to reclaim a lost love. At the other extreme, the quite clever The Devil is a Part-Timer (stranded in Japan, the devil gets a job at McDonald's to make ends meet) features both a "Satan" and a "Lucifer." The only overtly "religious" aspect of The Devil is a Part-Timer is an institutional church roughly analogous to the medieval Catholic church (under the Medici popes). The state religion in Scrapped Princess is largely the same. Then there's the offbeat syncretism of Saint Young Men, about Jesus and Buddha hanging out in modern-day Tokyo. Manga artist Hikaru Nakamura approaches the subject with a goofy but respectful touch. Unless you find the concept itself heretical, there's nothing blasphemous about it. Saint Young Men is hugely popular in Japan (a staggering 10 million copies sold) and won the 2009 Tezuka Osamu Cultural Prize. An anime is currently in production and a movie adaptation was released in 2013. One can only pray that one or more of these versions makes its way here soon. Saint Young Men has been licensed in China and Europe but not North America. The Japanese publisher is understandably skittish about the possible fallout. In fact, the vast majority of Christians react to this type of thing the way the vast majority of Mormons do to The Book of Mormon by South Park creators Trey Parker and Matt Stone: "Hey, they spelled the names right!" What's annoying is blasphemy arising out of self-righteous contempt. What gives manga publishers pause when it comes to the U.S. is the fear that somebody is going to whine and stamp their feet and the bad publicity will kill sales. Nobody's going to get killed. Though the suits understandably get skittish about the fringe elements that breath such threats. references to God were removed from the first two volumes in a possible anticipation of a TV broadcast. Considering that Seira Mimori [the protagonist's sidekick] spends half of the time in a nun's habit, one wonders why they thought they could do Saint Tail without references to God. Common sense ultimately prevailed and the censoring was stopped with the third volume. This is rarely a problem in Japan, where the whining and foot stamping mostly comes from the political right. They're strident secularists, except when the emperor enters the picture. Then they turn into strident Shintoists. Until they die, that is, at which point Buddhism kicks in with a vengeance. "Buddhism for the dead, Shinto for the living," so the saying goes. In everyday life, Japanese move back and forth between Shinto rites and Buddhist beliefs (and Christian wedding ceremonies). It's not that the adherents are blurring the lines. The lines were never firmly drawn in the first place. You might expect this sort of fuzzy wuzziness to lead to the apathy and neglect that emptied out the churches in secularized Europe. But in Japan, people not getting worked up about stuff can motivate the curious to mix and match belief systems in ways nobody else would have dreamed of. And in the process, scrub the dust off of old, worn-out tropes to reveal a shining gem buried beneath. In a recent Spengler column David Goldman foresees an ascendent China, but not on purpose. China is not planning to take over the world. It doesn't want the world. It doesn't like the world--that is, the world outside of China. Unlike Greeks, Romans, Muslims, and European imperialists, it does not want to plant its flag outside its borders, send its young men to conquer and defend new territories, or subject other peoples to colonial rule. Nonetheless, it may inherit the world, reluctantly and by default. This is a good description of Japan's foreign policy as well. In its 1500 years of documented history, the final decade of the 16th century (two pointless invasions of Korea in 1592 and 1597) and the half-century of military adventurism from 1894 to 1945 were the disastrous anomalies. Emerging from its self-imposed isolationism in 1868, Japan found itself surrounded by paper tigers. Flailing about for a raison d'être, it seized once again (after almost 300 years) on Oda Nobunaga's dream of a Pax Japonica in Northeast Asia. It took Japan another fifty years after that to figure out it was really bad at European-style colonialism. The problem was, in the short turn, the Japanese navy in particular proved itself quite capable at winning individual battles. But the government had no idea how to rule what its soldiers and sailors conquered. The era of European colonialism was almost over. Japan came to the imperialism party a century too late. Even so, by the end of the Russo-Japanese War in 1905, Japan did rule over an honest-to-goodness island empire stretching from Sakhalin down to Taiwan. Japan would negotiate away Sakhalin (it was too big, too underpopulated, and too far away), and it would have eventually had to give up Korea (as England was to Ireland and Scotland, Japan was to Korea and Taiwan). But an empire it was, giving Japan complete control of the sea lanes across Northeast Asia. Ah, if only Japan had stopped there. The Chinese Communists would never have come to power: a Japan not at war with China would have happily helped Chiang Kai-Shek exterminate them. Alas, Japan couldn't let go of the dice and inevitably rolled snake eyes a hundred times in a row. After the Occupation, the Japanese went back to being Japanese. For a while on the global stage, it looked like it might win economically what it had lost militarily. But then the economy crapped out too. With a collective shrug, the Japanese went back to being Japanese. The 250 years of the isolationist Edo period define the national character far more definitively than the hundred years after. Those were the good old days. Likewise with China. The lesson of the Yuan Dynasty (1271-1368) was that any interlopers would be assimilated. The collapse of the far-flung Mongol Empire proved the point. Its sabre-rattling notwithstanding, China will ultimately settle for outwaiting Taiwan, just as it is absorbing its other "lost" provinces. Despite its Security Council posturing, China greatly benefits from the current status quo. The U.S. (and its ostensible allies) kick the hive while China collects the honey. But the status quo isn't going to last. More fracking and more pipelines (one way or another) will leave the U.S. even less dependent on oil imports from outside the Americas. The burden of securing the flow of Mideast oil will increasingly fall on China, arousing the radical elements in the Mideast to start playing chicken with the Far East. China has an additional motivation here: to keep Japan from seriously rearming. To do that, it will have to pick up where the U.S. military leaves off. Except Goldman is right: that's the last thing China wants to do. China leaders are bemused by America's sudden and unexpected withdrawal from strategic responsibility, for example, in the Persian Gulf, and are struggling to devise a response that would ensure the security of oil supplies without entangling alliances and risky military commitments. It is a comedy of errors rather than a conspiracy. But to keep its economy going and the Mandate of Heaven secure, China won't have a choice. Well, as Uncle Ben could tell them: "With great power comes great responsibility." In Appleseed (1985), the future is still run by giant mainframes. That was soon to change. The "difference engine" was first proposed in the late 18th century, but this now well-worn trope truly came into its own as mainstream entertainment in the 1950s with the Tracy/Hepburn comedy Desk Set (1957) and NASA's adoption of the IBM 7090 at the dawn of the space race. Only four years after Appleseed, Masamune Shirow saw the future and the future was networked. The last line in Ghost in the Shell (1989) says it all: "The net is vast and infinite." This marked a true sea change in the genre. The "computer" would no longer be a single "character" (an electromechanical dictator) but part of the landscape. This is especially true in the Stand Alone Complex series, in which cyber is simply there, like the water and air. As Google chairman Eric Schmidt put it recently, "The Internet will disappear." Meaning that it will become as ubiquitous as electric power and radio waves, treated as a given, as if it has always existed and has always been available, and so is only noticed when it is not. Alas, too many Hollywood science fiction writers are stuck on the mainframe as the "Big Bad" and "hacking" as a magic wand. A quarter century ago, Shirow got it right. • Plus 1997 and 2015 video games. 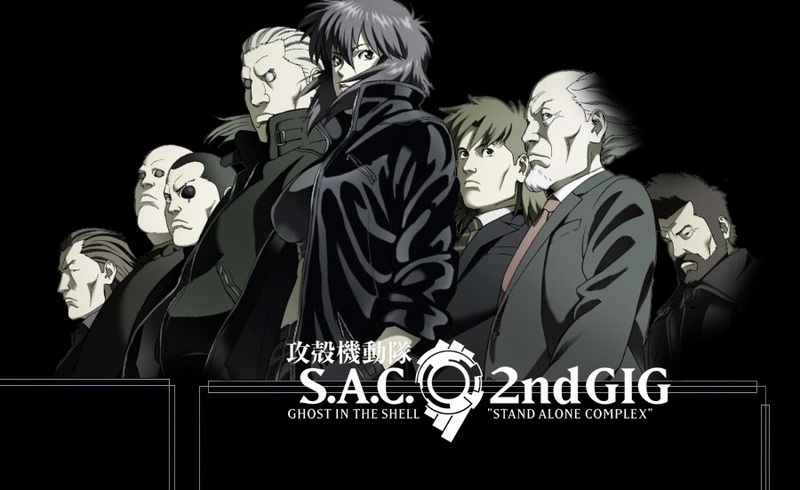 Right from the start, Ghost in the Shell throws a wrench into the sequel machinery. Kusanagi merges with the AI at the end of the first movie. In Innocence she appears only virtually. So the only place to go without completing trashing the premise is backwards. Thus Stand Alone Complex is a prequel. The two SAC series are not only superior to the original but rank among the very best in the genre. The latest installment in the franchise, Ghost in the Shell: Arise, is a prequel to the prequel, including an "origins" story. 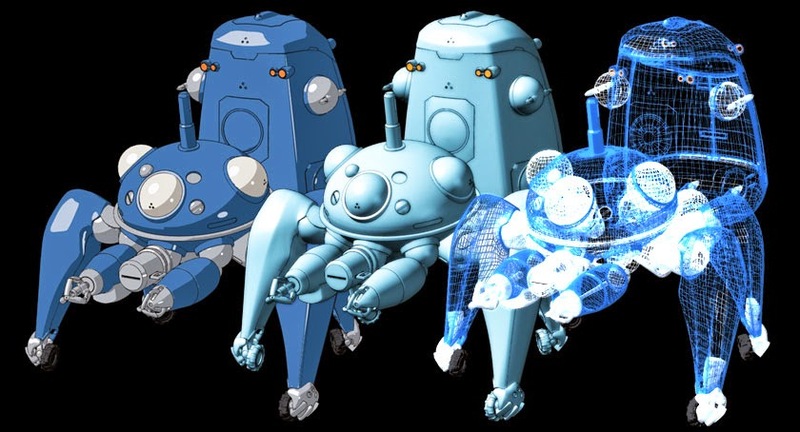 The real stars of SAC: the Tachikoma robots (Wikipedia Commons). And talking about allegiance to established canon (or the lack thereof), Dreamworks has signed Scarlett Johansson for a 2017 live-action remake of Ghost in the Shell. The casting has already raised questions among fans about how a "Johansson" can play a "Kusanagi." The obvious solution can be gleaned from A Fistful of Dollars (Yojimbo). Or Edge of Tomorrow (All You Need is Kill). Clint Eastwood and Tom Cruise are models for "occidentalization." Just keep the plot moving and don't bury the story beneath piles of ponderousness. A good story will always shine through. The fact is that people who like anime, depending on their exposure to Japanese culture, tend to like many aspects of Japanese culture, from popular to traditional, as well, and develop at some point either the desire to learn Japanese or visit Japan. In her conclusion, Manion describes the reluctance in western academic circles to accept anime as a "legitimate" example of Japanese culture as a reflection of "techno-orientalism," which she defines as a "certain discourse concerning Japan that seems unable to reconcile an image of Japan as traditional with the image of Japan as a modern economic power." There is on the one hand "exotic" Japan, characterized by "aestheticism, eroticism and idealization," and on the other "alien" Japan, which in the past was associated with "a dehumanized martial culture." But now, thanks to the technological advances and economic strength Japan has gained in the last few decades, has come to be associated with technology and business. This is a highly useful observation, though the "orientalist" label overly complicates the argument. Rather, the underlying ideology revealed here derives from what I call "neo-creationism," the near-universal idea, especially beloved on the academic left, that there existed a point in time when All Was Good, but from which we have since fallen like Adam and Eve. [Ancient Japan] is depicted approvingly, though ancient traditions have very little to do with the contemporary Japanese. The "good Japan," according to this director, is Buddhist monks chanting, ancient temples, flower arrangement; meanwhile she portrays contemporary Japanese as ridiculous people who have lost contact with their own culture. Or as Milton titled his epic poem on the subject: Paradise Lost. This belief motivates the Holy Grail-like quest for the Edenic past and Rousseau's Noble Savage (in a primeval rainforest near you). It is as pronounced in environmentalism as it is in orthodox religious movements. It looks back to the past, to a Camelot, when, Douglas Adams writes, "Men were men, women were women and fuzzy blue creatures from Alpha Centuri were fuzzy blue creatures from Alpha Centuri." Academics who make a career of this nostalgia conveniently find these Edens within their particular academic specialties. And bully for them. There is much value in remembering and preserving the past, if for no other reason than to remind ourselves how lucky we are not to be living there anymore. But the past is not a This Old House project that can be updated with all the comforts of modern living while preserving the "original" look. The past is the past because our ancestors left it there, and more often than not, good riddance to it. The added irony is that the modernity seen as so inimical to the past is in fact its best hope of preservation. Only wealthy, modern, first-world countries can afford to take environmentalism seriously, and can afford to pay people to care about how people were living centuries ago. And can afford to produce (and sit around and watch) shows like Antiques Roadshow (I prefer Salvage Dawgs). Hence, the place to find the well-preserved artifacts of Chinese history and culture is in one of the world's most technological, post-modern societies--Taiwan--not Mainland China, whose communist government had no use for the past during its many Great Leaps Forward. Evolution didn't stop when homo sapiens stood up and took a bow. Both speciation and extinction inexorably continue. Culture and language change--evolve--with an equally remorseless momentum. We know this in our bones even if we deny it with our rhetoric. For if there were indeed a unique and privileged past, we could single it out, pack it off to a museum, and dispense with everything else. But knowing that there isn't induces a pack-rat mentality that instructs us to scamper around saving everything just in case it might come in useful one day. Manga artist Masamune Shirow was the first to capture the true scope of cyberpunk in the late 1980 and early 1990s. Taking visual inspiration from Ridley Scott's Blade Runner (1982), he defined the look and feel of the genre in ways that Hollywood is still catching up with. The opening scenes of Ghost in the Shell owe a lot to Ridley Scott. Black Magic (1983) got an OVA (meaning: direct-to-video). The goofier Dominion Tank Police (a personal fav) spawned two TV anime series besides the two manga series (1986 and 1995). For most manga artists, that'd be more than enough success for a lifetime. But it was Appleseed (1985) and Ghost in the Shell (1989) that took on lives of their own. Neither franchise demonstrates much allegiance to an established canon. With new production teams taking up the reins each time around, every iteration gets its own reboot. Examining his original manga, you will notice that Shirow and Frank Frazetta share a similar visual aesthetic that gets toned down (a lot) for anime (and that includes the Ghost in the Shell movie). Shirow has also published two dozen art books and poster collections. • Plus a 1988 video game. 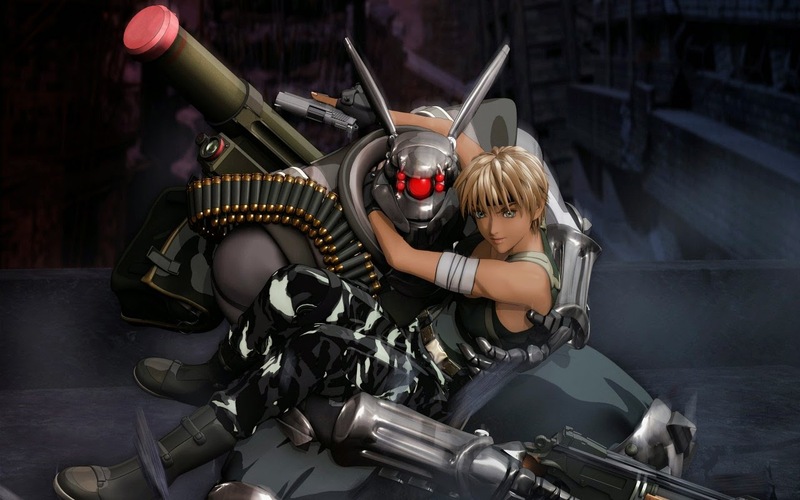 Appleseed sprang back to life after a fifteen-year break using motion-capture digital animation for all productions. I guess if you go full digital once, it gets easier to keep on doing it that way, because that's what they've done, including the television series. The first two films and series stick to the original premise: Deunan Knute and her cyborg partner (and boyfriend), Briareos Hecatonchires, are members of an elite SWAT team/special forces unit in Olympus, the futuristic, post-apocalyptic city at the center of everything. The real wildcard is the latest, Appleseed: Alpha, which jumps completely out of the established timeline. Deunan and Briareos haven't even gotten to Olympus (and aren't even sure they ever will), and yet they are clearly older and wearier than in the Olympus arc. Alpha is, at heart, a classic road movie, and that's a good direction to go in. Olympus pulling the strings from afar rather than up close creates more latitude in the storytelling. Besides, the whole utopian society (but it's rotten underneath) cliche is pretty tired. On their way to the mythical Olympus, Deunan and Briareos keep getting sidetracked. And at the very, very end (wait for the credit roll), we learn that Olympus plans to keep on sidetracking them. I'm game. I like the direction Appleseed: Alpha is taking things. I hope they keep heading down that road. In a world where you can become top dog simply by being holier-than-thou, everybody else must necessarily be your moral inferior. And when moral superiority becomes the coin of the realm, the currency will be counted in "positional goods." is acquired in order to set oneself apart from others. Positional goods therefore have a peculiar property: the utility their consumers derive from them is inversely related to the number of people who can access them. The existence of positional goods illuminates the essential fallacy of the "Lake Wobegon effect," particularly when it comes to moral outrage: not everybody can be above average, even when the item in question is a subjective one defined purely by perception. Thus it follows that any standard of political correctness, once achieved, demands ever more strident definitions of political correctness. The only way to maintain a morally superior status is to continually tighten the requirements for belonging to the club. We cannot all be morally superior to each other. Once you have successfully exorcised a word or an opinion, how do you differentiate yourself from others now? You need new things to be outraged about, new ways of asserting your imagined moral superiority. Hence the growing legions of sociopathic Santa Clauses checking their lists and checking them twice to decide who's been naughty and who's been nice. Except there already exists an established system operating outside the rule of law. It's also a hierarchical social order that harangues heretics, enforces taboos, subjects sinners to public sanctions, and promising to redeem the penitent through acts of penance. That's right. No sooner had the enlightened elite declared that God was dead, but they busily set about reinventing the Mosaic Law. Or maybe they believed all along that religion was the opiate of the masses and this time wanted to be the pushers. One reason Frozen was so successful in Japan is that it's a spot-on execution of the "magical girl" (mahou shoujo) genre. As with Akira Kurosawa and the Hollywood Western, the inspiration goes round and round. With Puella Magi Madoka Magica, this cross-cultural fertilization has produced a near-perfect hybrid. The magical girl traces her roots back to the television classic Bewitched (1964). A dubbed version soon showed up on Japanese TV and inspired Toei Animation's Sally the Witch (1966). • The heroine (a teenage girl) must keep her magic secret. • When she uses magic, she needs a special magical phrase and an enchanted object like a baton (a supercharged wand). • A magical servant (or familiar) accompanies the heroine back and forth between magical and normal worlds. Though this basic approach remains as popular as ever, the genre has evolved to include tomboyish protagonists, fierce rivals, evil antagonists, dark outcomes, weird weaponry, and "fan service" (you won't find that in a Disney cartoon). Also unlike its Hollywood precedents, magical girls often battle the bad guys under the direction of a shadowy (extraterrestrial) organization monitoring the planet. Though wielded in "Abracadabra" terms, their powers align with Arthur C. Clarke's dictum: "Any sufficiently advanced technology is indistinguishable from magic." There's a lot of Batman in a magical girl. In Puella Magi Madoka Magica, that designation belongs more to Homura Akemi, Madoka's self-assigned Dark Knight. Like Batman, hers is the morally murky world of a person who has seen too much and done too much and gotten nowhere. Brute force is pretty much all she has left. The enemy Madoka is being recruited to combat are malevolent witches zombifying people from the shadows. The magical girls battle them in a kaleidoscopic netherworld that was apparently designed by Henri Matisse after a bad hangover, a medieval contrast to the shiny, post-post-modern "real" world (click to enlarge). Said Jung, "In the Shadow is the gold." The shadows are dark and deep. There are bigger conspiracies at work here, and those witches aren't what they appear. A devastating revelation tells Madoka they are souls in need of redemption, transforming Madoka Magica into an exploration of the doctrine of universal reconciliation. The first two episodes deceptively duplicate the cutesy magical girl formula exactly, until the end of the third, when somebody's head gets bitten off. And not any old someone but a main character. Imagine a Disney cartoon abruptly reverting to the original Grimm version, with the rest of the cast viciously turning on each other. Elsa going off the deep end in Frozen is actually according to the formula. Magical girls often go off the deep end or end up fighting other magical girls who've gone off the deep end. 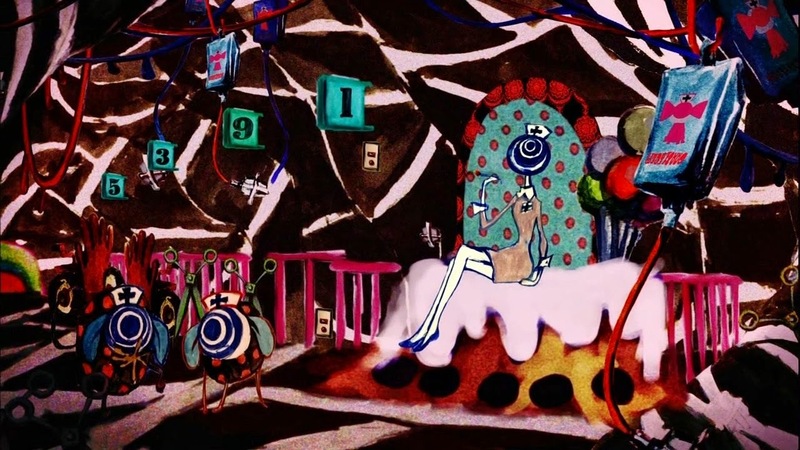 But in Madoka Magica, the stakes quickly escalate beyond internecine rivalries. Faust is a scholar who is highly successful yet dissatisfied with his life, so he makes a pact with the Devil, exchanging his soul for unlimited knowledge and worldly pleasures. "Faust" and the adjective "Faustian" imply a situation in which an ambitious person surrenders moral integrity in order to achieve power and success for a delimited term. All magical girl have a cute familiar (and recruiter). 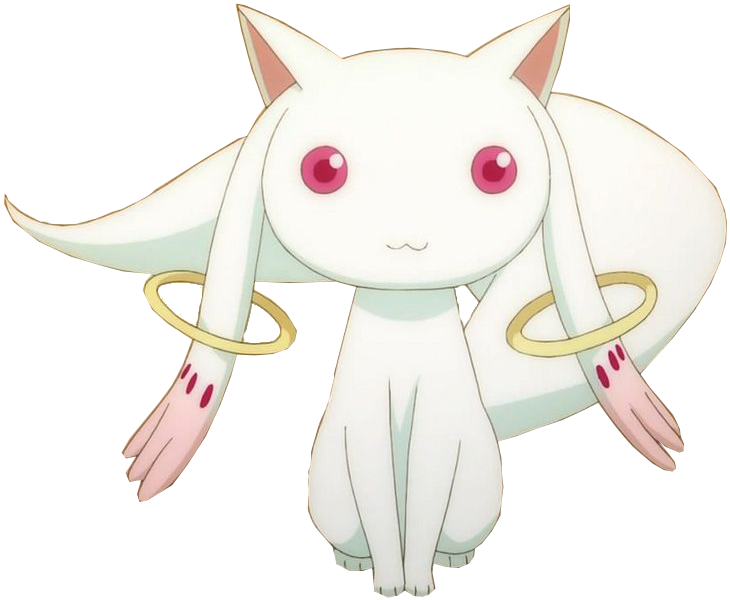 In Madoka Magica, it's the rabbit-like Kyubey. He's revealed (by Homura) to be Mephistopheles. Madoka would seem at first to be Faust. If so, she's a very cautious Faust (again thanks to Homura), not following the rest of the magical girls when they jump off the cliff. The temptation is that Kyubey really can grant them anything they can possibly imagine. Giving the average teenager god-like powers is not a good idea, especially when the scales of the universe must inexorably balance: the greater the bestowed "gift," the greater the damnation that awaits them when they fall. And yet such divine power opens the door to the possibility of an atonement. 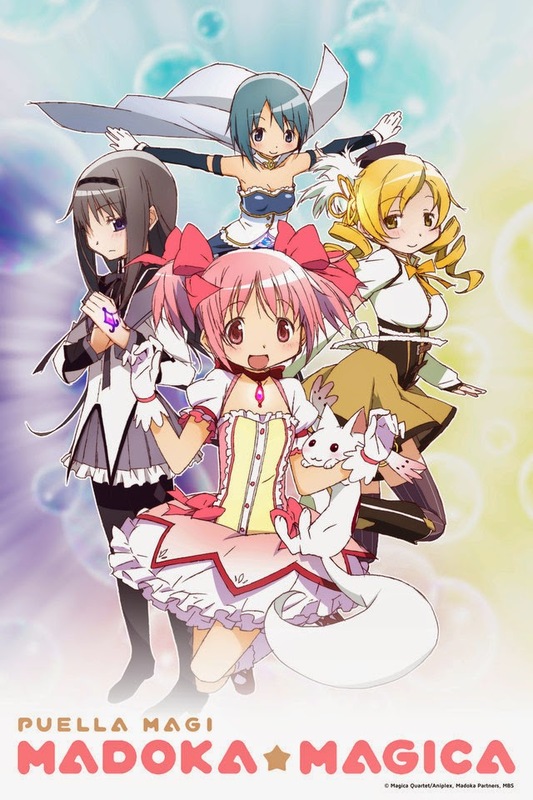 The first part of Madoka Magica is largely a retelling of the temptation of Christ (Matthew 4:1-11). Madoka's guide through the wilderness is Homura, who appears as an Old Testament prophet, speaking harsh truths none of them wants to hear. With kindness comes naivete. Courage becomes foolhardiness. And dedication has no reward. If you can't accept that, you are not fit to be a Magical Girl. Except it is courage and kindness that drive her forward. Like Peter drawing his sword in the Garden (John 18:10-11), Homura tries to prevent the inevitable. "By grace we are saved, after all we can do" (2 Nephi 25:23) sums up her character arc, especially the doing part. But also like Peter, Homura cannot "save" Madoka from her destiny. Madoka and her fractious apostles (Homura on her right). For in the end, Madoka must take up her cross and lay down her life to save her friends (John 15:13). 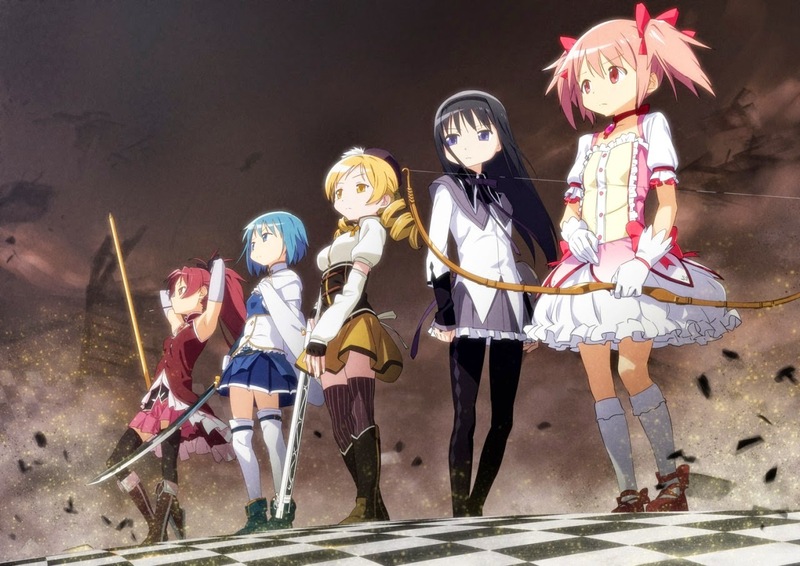 As with Scrapped Princess and Haibane Renmei, the freewheeling elements of genre anime fantasy in Madoka Magica plunge right to the heart of Christian eschatology. Unconstrained by a cultural rule book dictating what is and isn't "acceptable," Japanese fantasy writers reshuffle the metaphorical deck with few self-imposed constraints. The plotting must also be disciplined by grounding the narrative in some sort of plausible logic. There must be rationality behind the resolutions. Reading too much science into fantasy can get problematic. Fortunately, Kyubey sums up the "magic door" simply and expeditiously, and is convincing enough for the tale to hang together. C.S. Lewis resorts to a literal deus ex machina with his hand-wave of "deep magic" to resurrect Aslan. (The White Witch must have missed that particular script meeting.) But Madoka's decision aligns with the rules of the game exactly as Kyubey has explained them. What makes Kyubey terrifying is that he's stone cold rational. It's the same premise as Monsters, Inc., this time taken to grotesque (yet logical) extremes. Angst comes into its own as a compelling plot device! Which also makes the reason for targeting teenage girls darkly hilarious. As a result, Madoka's solution rings that much more true within the framework of the story and Kyubey's scheming. To be sure, Madoka is a Lorenzo Snow kind of savior (with some Buddhist sensibilities thrown in for good measure, plus a neat theory of divine omniscience): "As man now is, God once was." Supposing that God was once a teenage girl with a penchant for pink. I'm an armchair dilettante when it comes to most hobbies, the same way I like hardware stores and watching This Old House but never plan to own a home. I'm not interested in model planes; it's the technology that fascinates me. When I was a kid, model plane power plants came in three varieties: your arm, rubber bands, and (glow plug) diesel. Those glow plug engines were temperamental too. I recall as much effort being spent getting them to work as flying the planes. These were free-flight or string-controlled planes. Though RC (radio controlled) model planes did exist, the technology was rudimentary and expensive. Now it's sophisticated and cheap. 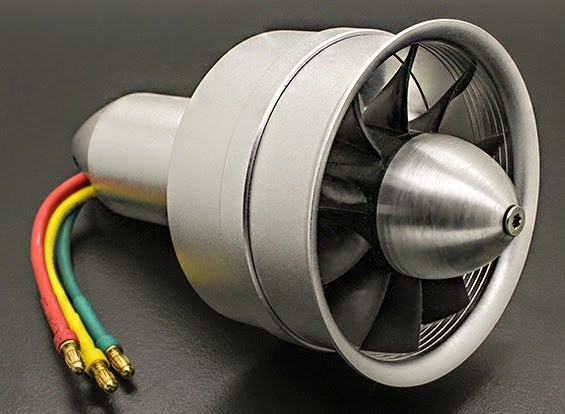 Digital wireless, lithium-ion polymer batteries, and microprocessor-controlled brushless electric motors have eliminated most of the old frustrations. Helicopter drones have been the big winners in this new market, both hobby and pro. And now there's the electric ducted fan. The EDF is an electric fanjet that does a good job of pretending to be a turbojet. Scale models using EDFs mounted in lightweight expanded polypropylene foam airframes look and fly like the real thing. Here's a F/A-18 powered by a pair of EDFs. Quite often in science fiction these days, it's the fiction that has to catch up with the science. The original Star Trek got the flip phone right. But it and its sequels couldn't foresee the practicality of drones. The military certainly has. Full-scale electric planes do exist. Elon Musk sees a future for them in commercial aviation, when "everything but rockets--ironically--will be electric." He'll be right if he can increase the energy density of batteries an order of magnitude. Alas, even Musk admits that most of the battery "breakthroughs" publicized on a nearly weekly basis are impractical nonsense. Some day soon, hopefully. Unless you're flying model airplanes, that is. They work fine now.